Working hard on "Shadows on the Carpet Part I"
After getting through the holidays and then the snow and more snow and deep freeze, I have been busy working on preparing "Shadows on the Carpet I" for publication. 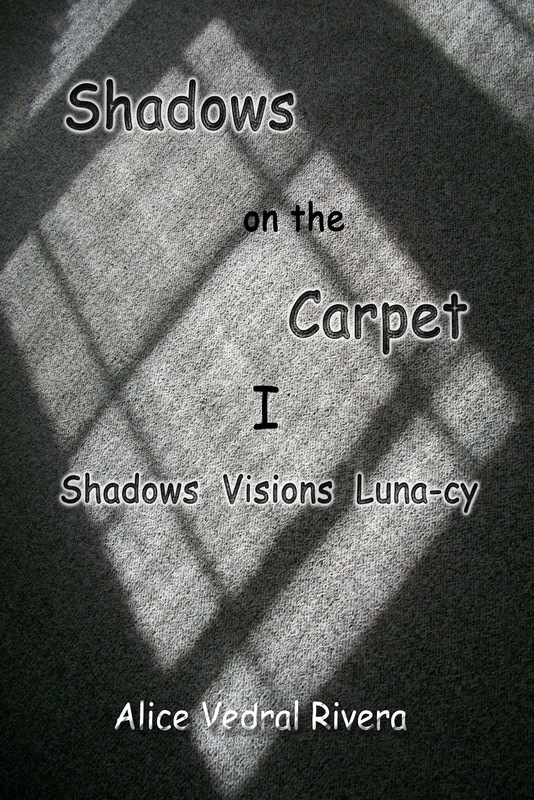 I decided to split Shadows on the Carpet into 3 books (each book with 3 sections and containing about 35 poems). Part I - Shadows, Visions and Luna-cy is almost ready. Formatting is still the biggest challenge for me. I finally have a revised front book cover for part 1. Neither software nor hardware were cooperative and every thing took me longer than I expected due in part to some 'operator error' and program incompatibility. I still need to come up with something for the back cover and finish formatting the manuscript to fit the template and be aesthetically pleasing to my eye. This 1st part will contain the most direct and overt social/political commentary poems with some relationship under tones - a descent into the abyss so to speak. The 2nd part will be falling deeper into the pit and part 3 will be hitting rock bottom and the climb back up and out. Two and three will contain more overt relationship poems with social/political undertones. Sharing the revised front cover with you today. Comments welcome!